Try a delicious dipped dubstep pop! The immediate impression after even the very first listen is that Tommy Candy Shop Sugar Me is a deliberate attempt to re-create the sound and feel of the first Tommy February6 album. The synthesizer is beautifully full sounding, the drum beats are punchy, and her singing is back in top form. The sad or reflective songs are small in number, so the album doesn't have an overwhelming feeling of depression wafting around its every word. Every consideration has been made with Tommy Candy Shop Sugar Me to refine the February6 sound. It envelopes the entire library of previous February6 material, taking the best parts of each. Clocking in at 43 minutes, the album is actually shorter than both previous Tommy February6 albums. Can it make up for that in quality? The album starts with full sounding synth in both ears. The vocals come in long before the drums, which start merely as quiet claps before evolving into heavier beats. The chorus wouldn't sound out of place in any dance club. While generic, it still has that Tomoko edge. After a few choruses, the track dies down a little to emphasize the melody. The final chorus has extra notes. This "thumpy" beginning is also fairly generic with a heavy bassline. The chorus is a rather cheerful sounding and follows a decent pace, has a nice flow to it, and lasts just as long as it needs to. The song seems rather uneventful but is pleasant to listen to. After the second chorus, a bridge builds and Tomoko asks us if "we believe in magic". The song then enters an instrumental version of the chorus, and now the 80's influence is obvious. The chorus returns and now feels fresher than before, and the almost robotic sounding background melody is a nice subtle change. Darker sounding and with an almost macabre sounding bass synth. The section ends and leads into a once again generic dance music build, which then goes to a pacey, bouncy build. A build into a build. Hmmm. Nice. The chorus comes along at just the right time to smooth off the deal, and the following melody after the chorus is pleasant. The following male choir voices are the finishing touch of beauty. The song then returns to the dark sounding verse, and then again, into the build. It builds with a snare drum, and then, goes into the second build with the bass drum. The drums become more complex, leading again into the beautiful chorus. The club music influence has really rubbed off on Tomoko, but that is fine. It fills in the quality gaps present in Tommy Airline pretty well. A beautifully piano driven intro with punchy drums. Is she...? Is she going to do...? No, it isn't going to be a dubstep song. The synthesizer enters the mixture and the drums get a little bit heavier. The singing and the following repetition of each line is just... nice, you know? After the chorus, the second verse has little difference to the first. The build up is coming, is it going to? No, not dubstep. Why does it feel like she'd do a dubstep song on this album? Either way, that beautiful chorus comes back, with the beautiful line repetition. The song ends beautifully by dropping back to the piano and singing from the beginning of the song. Nice. First off, I can't get the image of Kevin Spacey in the cowgirl position out of my head. Secondly, the song starts with a beautiful funky guitar lick. The verse then completely ignores the nice guitar and drops back to the more-or-less uneventful synth. Stays like this until the chorus, where a bouncy synth cycle fills the sound gap, but it just doesn't sound anywhere near as good as those opening seconds. The guitar returns, and then disappears again as the second verse rolls in. It is bait and switch, but this only really works if the bait is bad the switch is good. But this is the other way around. The second chorus is still as exciting as the first — not exciting at all. Whoa! We got our dubstep drop! After that, the synth plays on its own. The song sounds like it is starting to build. The bass from the drop returns, the snares build up, and the song just evolves into something good of all a sudden. The final chorus stems off from it, but sounds exactly the same as the last two. At least that little extra chord sequence at the end adds something, but as a whole, this song is the weakest so far. Carrying on the theme that the album doesn't have to be musical, this song begins with a non-melodic ugly sounding bass section. The chorus has that unfitting horror sound that Tomoko insists on doing, and it is even bleeding now from Heavenly into February. It just doesn't work. The second verse has some variation, a little bit of the backing drops out. But the song just fails to go anywhere from this point, settling for poor when it could be shooting for so much more. Then comes the build, where the melody comes in. It sounds excellent. A breath of fresh air. The diamond in the rough. But is it going to go into something great? No. Here's another dubstep drop. I wish I hadn't opened my mouth now. The song continues to be boring and insignificant until it finally peeters out, much later than it really should have. At least no tracks have faded out yet. Or have I jinxed that now, too? Incredibly promising. Sounds like Futari no Seaside and ♥KISS♥ ONE MORE TIME had a musical prodigy. The verse is heavenly, and not the rock kind. The celestial kind of heavenly. While the verse has little going on, it still sounds great. The chorus is in a league of its own, it's flawless. The song returns to the verse, which has very little changed from before, perhaps a few more notes. It emphasises the words and lets you know the chorus is going to be better, which it then is. Those extra notes from the verse are built upon. The bridge is glorious. Goes into a dubstep drop! But hey, it's good this time! It doesn't sound out of place! It lasts mere seconds before going into a pleasant "la la la" sequence before ending abruptly, but hey, it had the decency not to fade out, unlike Futari no Seaside. This incredibly bouncy, upbeat track starting out with a fantastic guitar sequence. The verse leads into the chorus, which is quite frankly amazing. I don't think any more needs to be said, as my words wouldn't be able to do it anywhere near enough justice. The chorus leads straight into the second verse, and the song just continues to outshine everything else on the album by absolute strides. The second chorus sweeps in and takes the limelight, and proves to us and the whole world that on every Tomoko project, one single track reaches the full potential. This song was written completely by Tomoko, without input from her other associates, and it shows. The final chorus starts without singing, opting for an outstanding synth line, before revealing to us that, hey, it was just fooling us. Tomoko's singing comes back in, and eventually closes the song. Hearing Tomoko say "horidays" is a nice little extra, I always found her ability to pronounce some L sounds but not others to be really cute. Slower, more reflective, ballad-like. But not a ballad! There is way too much instrumentation here for it to be one of those. The lyrics here are just adorable. The chorus has a wonderful, meandering vocal line, and then goes into a gorgeous Summery sound, fitting of the song's title. It's just pure gold. The second verse has a lot of instrumentation drop out, but has a thumpy bass drum keeping the beat. As the toms come in, the verse leads into the chorus with a melodic sequence and Tomoko asking for a daiquiri. The chorus is still adorable. I love that after the chorus the song drops out to more-or-less just vocals. The synth returns, sounds like it has changed subtly, and carries us out to the fantastic ending, where the image of sunsets on the beach, log fires and—hey, did you just fade out?! Why would you ruin a glorious moment like that? It's the only one; I'll let it slide. Rather than ending the album on a slow and reflective ballad, instead a feel-good catchy pop song with some gorgeous acoustic guitar and funky bass, with a twinkly sounding synthesizer sequence, caps the album off wonderfully. The verse has a nice echoey piano sound in the background as the drums borrow heavily from Katrina and the Waves' "Walking On Sunshine". A nice guitar part rounds off the backing, and it fits the vibe of the whole album wonderfully. This is one of those Summer month albums, but you know what? It brings that vibe to any other time of the year. The chorus is mind-blowing. I didn't think we could get a chorus better than My Vacation, but I think it has been managed merely thanks to the end of the chorus, which borrows a different type of word structure and changes the pace of the song for a short moment. The second verse keeps up the funky sounding guitar line, and builds slightly on it just enough to make a noticeable difference. When the synth drops back a little, the guitar picks up the flak. As the chorus leads into the chorus, it sounds magnificent. After this chorus, a hilariously bad skit happens which straight up makes me cringe, but it's incredibly cute. It makes me smile, if only for Tommy's poor but charming pronunciation and enunciation. The role of the chocolatier, played by co-writer James de Barrado, that makes me simultaneously laugh and roll with embarrassment. "Will you be my valentine?" Yes, Tomoko, a thousand times yes. It's a nice, soft end to the album that doesn't feel the need to be slow. Ends with the sound of a motorbike driving away. This album. There really are no words for how far out of the park the ball has been launched here. I think that maybe only two of these songs are in any way poor, but I wouldn't cut them. This album is one that can be listened to on a track by track basis, or as a whole. The structure of the album and the song selection is pretty much flawless, I wouldn't move a single track around here. I'm absolutely impressed. 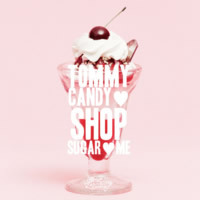 After Tommy Airline left me slightly dissatisfied, Tommy Candy Shop ♥ Sugar ♥ Me left me flabbergasted, but in a good way. This is Tomoko really reaching for her potential and just giving it everything she has. A little shorter than the other February 6 albums, but every bit as, if not more, sweeter than them all.